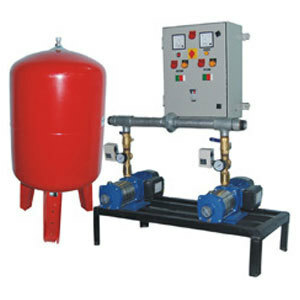 BLAIRS Hydropneumatic Pump Hot water circulation system monitors temperature in return pipe operates according to the increase and decrease of temperature, starts as the temperature decreases and stop as soon as reach the required temperature maintains an stable temperature through out the pipe line. Control panel consisting of MCB's, Contactors, overload relay, cyclic timer for pumps to be rotary every 15 minute (adjustable as per requirement), push button, auto manual switch and switch for particular pump operation, Digital Temperature Display in return Pipe, volt meter, ampere meter, Temperature sincere to switch on the pump and off the pump at an certain temperature. BLAIRS hydro pneumatic system consists of an automatic pressure controlled pump and a pressure tank. This contains an air filled poly-ether-urethene (PEU) bladder. The water gets pumped in this tank that compresses it and pressurizes the bladder which in turn maintains a desired pressure within the whole water system. This automatic system requires no manual intervention and is built for low maintenance. As the entire distribution system is kept under pressure by the system. HIGHLY ADVANCE VARIABLE FREQUENCY DRIVE (VFD)OPERATED WATER BOOSTER SYSTEM. The method of reducing starting current and inverter loading is to vary motor speed. The law of effinity states that the power required to run a pump varies as the cube of any change in speed. If one reduces the normal running speed of a 1 HP pump by 50% only 1/8 HP is required to run it at the lower speed. By starting the pump at a lower frequency and ramping up to full speed over a period of a second or so, starting current is greatly reduced. Another advantage of VFD controlled pump is that their speeds can be controlled automatically to provide constant pressure during varying flow conditions. A simple pressure transducer, connected to the VFD, monitors pump discharge pressure and varies motor speed accordingly. At the end power requirement will be reduced and power reduction will defiantly give savings of electricity bills. BLAIRS HPS constantly monitors the system pressure and acts according to the change in pressure. HPS can be installed at overhead tank or over the water storage sump which is mostly located in cellar or basement. With an assembly of a logic control panel unit with 2 to 6 pumps and a Pre charged Membrane pressure tank, the system is uniquely easy to operate from installation to everyday surveillance. Only required numbers of pumps are operational at anytime. The control panel variably adjusts the output of the pump for required operations. Providing change over from one stand by pump to another is unique feature of HPS. This ensures that all the pumps are put to equal use and operation of entire systems is steady and constant It also equipped with protection system from dry running when the suction tank is empty. The materials used for designing ensures that all wet parts never corrodes and no harmful traces of metal pass into the water. The pressure tank is made of Food & Drug Administration (FDA) and National Sanitation Federation (NSF) listed materials, thus are environmentally safe, Complete and efficient management of water & pressure.